ViewPoint from Ortho2 is more than comprehensive practice management. With imaging and communication capabilities, as well as our proprietary time-saving tools, the leader in orthodontic practice management is also the leader in value. 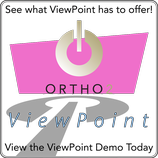 Also with ViewPoint, you have the entire Ortho2 team behind you. Our proven track record spans more than 30 years of serving orthodontists exclusively. Our mission is to help you succeed. ViewPoint is used by practices of all sizes—from single notebook startups to multiple offices networked with over 100 computers—and regularly updated with exciting new features and innovative technologies for our clients. ViewPoint includes everything you need to run your practice, resulting in a streamlined system for a smoother, more efficiently run practice. ViewPoint eliminates the cost and complexity of integrating programs from different sources to accomplish your goals. Use the features when you want at your convenience! 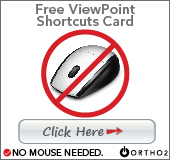 Click here to see what ViewPoint can do for you.